An innocent man was beaten, framed for felony assault against cops, and thrown in jail and the only thing that saved him was his video. Caldwell County, TX — An innocent man has received over $1.6 million from a civil lawsuit because he was beaten and framed by cops for being 100 percent compliant and never committing a crime. A federal jury awarded a Central Texas man more than $1.3 million in response to a civil lawsuit against Caldwell County deputies who arrested him on charges that were never prosecuted by the district attorney’s office. Lawrence Faulkenberry was also awarded $350,000 in punitive damages related to a deputy who initiated a leg sweep, his attorney said. This infuriating story began back in January of 2015 when Faulkenberry’s 16-year-old son decided that he would play a trick on his dad for grounding him. So, he called the Caldwell County Sheriff’s Department and claimed his dad was drunk and waving a gun. This 16-year-old’s prank nearly got his father killed. Deputies responding to the call arrived to find Faulkenberry entirely compliant—not drunk— and unarmed. He does not even own a gun. These facts, however, were of no concern to the cops who arrived only to assault, injure, arrest, and lie about Faulkenberry attacking them. “They yelled ‘sheriff’s department.’ What do you need? I put my hands up. ‘Turn around and walk backwards.’ I’ll stand here, you come here and put handcuffs on me,” Faulkenberry said. While on the ground, deputies rubbed his head into the gravel and punched Faulkenberry in the face, leaving his face covered in abrasions. “They left me laying on the ground for about 15 minutes, face down,” he said. 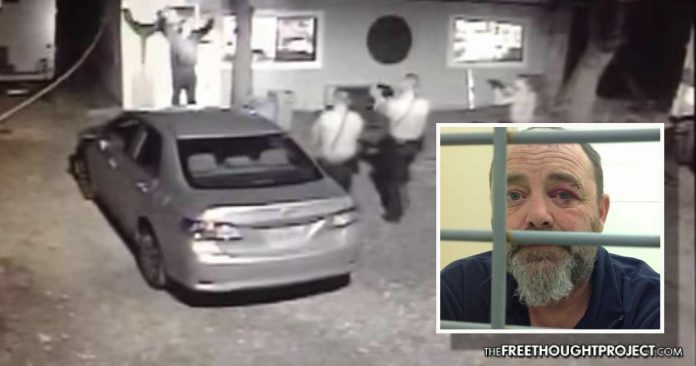 According to the police report, by Deputy Michael Taylor, Faulkenberry attacked the cops, and they were forced to beat him in an act of self-defense. After spending ten days in jail on felony charges of assaulting an officer and resisting arrest, prosecutors finally got around to viewing the surveillance footage that proved their cops were lying thugs. After they had viewed the footage, all charges were dropped. However, in spite of the video clearing Faulkenberry and proving the cops lied to set him up, not one of the three deputies involved has ever faced discipline. Caldwell County Sheriff’s Office deputies Dustin M. Yost, Michael Taylor, and Houseton (whose first name was not mentioned in the lawsuit), all named in the lawsuit, were never fired for nearly killing and innocent man and lying to frame him and put him in jail. Faulkenberry, who owns a motorcycle parts shop, was facing several years in prison. This innocent man could have been locked in a cage and deprived of freedom because of these lying cops, and yet it was the taxpayer forced to pay for the police officers’ negligence—to the tune of $1.6 million. “Without the video, I would be in prison. There is no doubt about that,” Faulkenberry said. Despite dropping the charges, the sheriff’s department stuck by their story. In response to Faulkenberry’s lawsuit, the department issued the following statement last year. Defendants specifically deny that they violated Plaintiff’s Fourth and Fourteenth Amendment rights or any other rights under the United States Constitution or the laws of the State of Texas. Specifically, Defendants deny that they used excessive force and unreasonable seizure, fabricated criminal charges, unreasonable search—warrantless search of property as alleged in paragraphs 29 through 32. The video below illustrates two powerful points. The first point is that filming the cops saves lives. The second point is that cops will lie to protect themselves and couldn’t care less about ruining the lives of innocent people in the process.